It’s almost Spring which means custom bachelorette tank tops are just around the corner. Kirkwood Trading Company offers a variety of clothing customized to fit each wedding parties needs. Each year it seems we do more and more of these custom prints and the sayings and phrases are pretty standard. If you are looking for ideas on specific apparel you’ve come to the right place for ideas. Let’s face it, men are pretty easy but clever. Great custom shirts and tanks usually do the trick and depending on the type of party (ie, party bus, destination, pub crawl) custom koozies are a great idea to for remembering the event. A lot of bachelors like to have a clever saying on the front and on some occasions get names and numbers or nicknames on the back of the shirts. With custom bachelor party shirts typically they are all the same shirt meant to remember the fun times had by all. Simple, to the point, no frills. Now custom bachelorette tank tops are the most popular thing we do for the wedding parties. Each party is different of course but tank tops are among the most popular choices followed by a female cut tee and then lastly a tapered unisex tee. Custom koozies are also a great idea to go along with the custom bachelorette tank tops. The women typically get a little more sophisticated by going with a different specific shirt for the bride to be, sometimes a different shirt for the maid of honor, and the the rest of the order is rounded out with shirts for the bridesmaids. Soft dual or triblend tank tops work the best because they give woman that softness they like. The colors vary and the styles of tanks vary from very basic, to tapered, to racerback options. 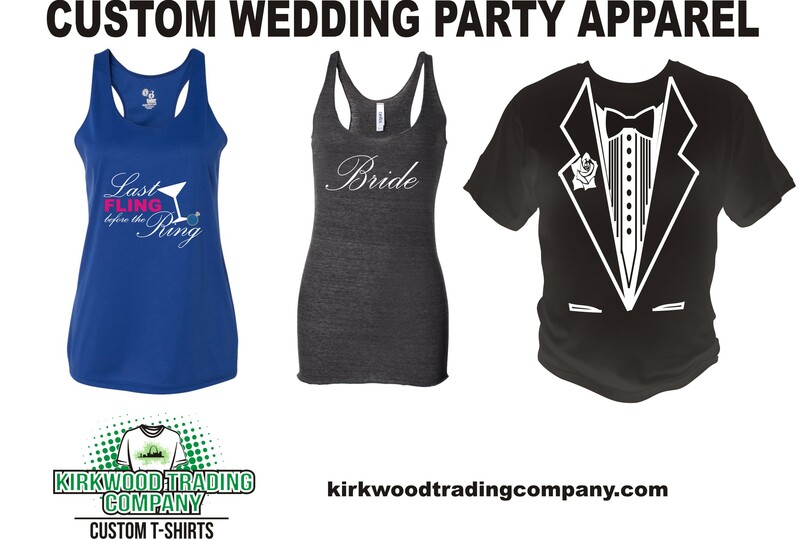 If you are looking for custom bachelorette tank tops, bachelor party shirts, wedding koozies, or any wedding party custom printed apparel and gifts, contact us at Kirkwood Trading Company and we’ll see what we can do. We have a lot of experience in these things and can steer you in the right direction if you are stuck.